Thanksgiving in New England has a nice ring to it, especially when your New York City hotel or apartment seems a bit cramped when the family convenes. One of our favorite places to visit is the Ocean House ‎ in Watch Hill, Rhode Island, an easy drive or train ride from the Big Apple. The “new” Ocean House, a 2010 reconstruction of the 1868 original, conveys the sense of a beach resort of a different era, but with decidedly 21st-century appointments and finish. The Ocean House, a member of the prestigious Relais & Chateaux resort group, sits on a bluff surrounded by mansions of this tony Rhode Island community. 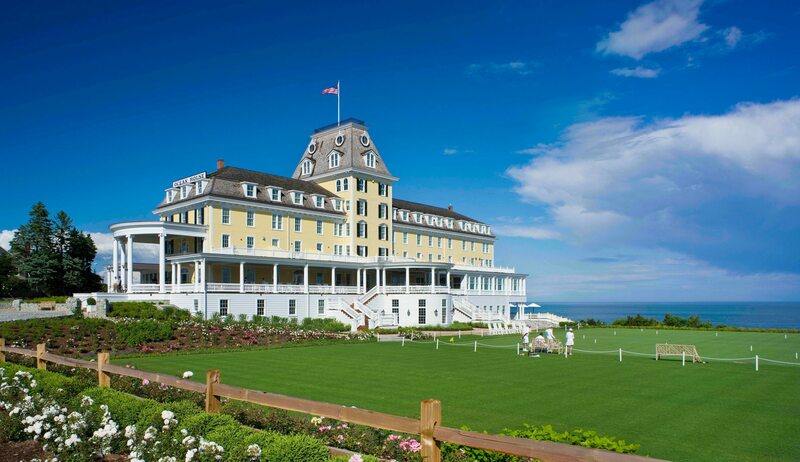 A true grand dame resort, the Ocean House caters to guests of all ages. Afternoon hot chocolate and cookies are a favorite among the littlest visitors, while grownups can fill their days with morning Tai Chi and beach walks as well as hours at the resort’s spa, gym, or indoor saltwater swimming pool. Accommodations are family-friendly with oversized suites or guest rooms. Colorful art from the owner’s personal collection adorns the public spaces and guest rooms. For Thanksgiving Day, November 28, dining takes center stage at the Ocean House, drawing on the resort’s focus on farm-to-table cuisine and New England tradition. Considerably different from the first spartan Thanksgiving shared by the Pilgrims and the Wampanoag Indians in Plimoth, Massachusetts in 1621, two bountiful Thanksgiving Day meals invite you to enjoy your turkey “by the sea” with Ocean House panache. The second option is to request a window table at the more formal five-course lunch and dinner in the oceanview Seasons restaurant. Seatings begin at 11:30am and end at 6:30pm. Adults and children each have their own menus with traditional turkey dinners and other dishes to complement. The prix fixe meals are $90 for each adult and child aged 10 and older. Children under 10 order a la carte from the kids’ menu. Weekend getaway packages are available. For dining reservations or accommodations, visit http://www.oceanhouseri.com/contact-us/. This entry was posted on Monday, November 11th, 2013 at 2:18 am	and is filed under Stuff to Do. You can follow any responses to this entry through the RSS 2.0 feed. You can leave a response, or trackback from your own site.